Drink containers make up almost half the volume of litter in NSW. The state’s largest litter reduction scheme, Return and Earn, started on 1 December 2017 to help reduce more than 160 million drink containers being littered each year. This follows South Australia which introduced its scheme in 1977, 40 years ago. In 2015/16, it achieved a container return rate of 76.5% and $58 million was refunded to the community. Western Australia recently announced it will commence its scheme in mid-2018. 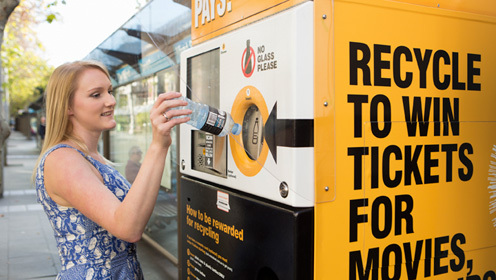 The Avalon Preservation Association has taken note of the chronic dearth of collection depots or reverse vending machines in Pittwater to date. As far as we know the only site in Avalon Beach is Danny Deli Cafe at 26 Avalon Parade, and that is an over-the-counter site. The nearest reverse vending machine is at the Time & Tide Hotel at Dee Why. The disinterest of businesses in housing collection depots or reverse vending machines makes it difficult and inconvenient for Avalon Beach residents to participate in the new scheme. Woolworths Avalon Beach is arguably the leading local retailer in the sale of soft drinks and other similar products relevant to the scheme. And yet Woolworths has not indicated any interest in or intention to participate by housing a collection depot or reverse vending machine in its store. APA recently wrote to Woolworths Avalon Beach expressing disappointment in their lack of leadership in this form of recycling and asked them to reconsider their position and to advise us. You can read the APA letter here. We await their reply, which we will upload here when received. The Manly Daily in its 14 March issue mentioned that a reverse vending machine has recently been installed in Warriewood, at the Northern Beaches Indoor Sports Centre in Jacksons Road.